Le tifinagh est un alphabet utilisé par les Berbères, essentiellement les Touaregs. Pourtant, ici, au bistrot Tifinagh, pas de plats berbères, mais un langage commun, celui des saveurs. C’est dans le 18e arrondissement de Paris, loin de la foule et des bus touristiques, dans le charmant quartier de Montmartre et à quelques pas du Moulin Rouge, que vous découvrirez le Tifinagh. Vous prendrez place dans un cadre boisé et orangé rempli d'objets éthniques et rétro du monde entier. Côté menu, le Chef vous servira une cuisine traditionnelle française, simple et de qualité. La carte propose nombre de mets qui ne laisseront pas vos papilles indifférentes. Aux beaux jours, vous pourrez profiter agréablement de votre délicieux repas sur la terrasse à l'ombre des tilleuls centenaires. Great service and food without emptying your wallet. The dishes change daily which makes each visit unique and enjoyable. This place is relaxed and comfortable. The food is good basic fare. Wait staff are great. Worth a meal. Very homey type of bistro serving great food at a very reasonable price. Will be back very soon. 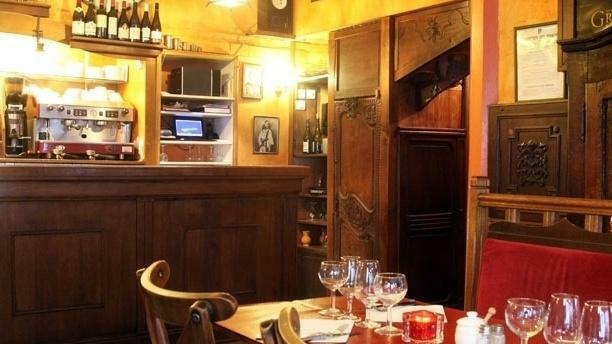 2 min walk from Moulin Rougue, lovely food & quick service. Don’t be put off by the old appearance. We booked for a meal before our moulin rouge show. The menu was traditionally french with enough options to suit everyone. Highly recommended ! The place was perfect. A lovely back street restaurant that was everything you could hope for when trying to find a traditional place to eat close to the Moulin Rouge. Samy the waiter was fantastic host and a credit to the establishment. Food was just above average. But service was really good. Nice place for a meal before heading to Moulin Rouge which was just around the corner. Great service!!! Made us feel very welcome and the food was lovely. Great location too ???????????????? Great food priced well. Awesome service. Real French atmosphere. Would come back. Awesome service and manner from the staff, food was amazing, good quality proper French cuisine. 59 euros for one 2 course, one 3 course meal and two 50cl carafes of wine. Excellent value with food quality to match. Excellent food and excellent value for money. Highly recommended.